The JHR Festival is one of Australia’s longest running Rock’n’Roll Festivals, a true celebration of everything great about the 50’s and 60’s era. The Ararat Jailhouse Rock Festival is one of Australia’s longest running Rock’n’Roll Festivals, a true celebration of everything great about the 50’s and 60’s era. Created in 1995 as a not for profit, incorporated body, as a celebration of all things rock’n’roll; the music, the dancing, the fabulous fashion, classic motorcycles & cars and of course, the Hot Rods! 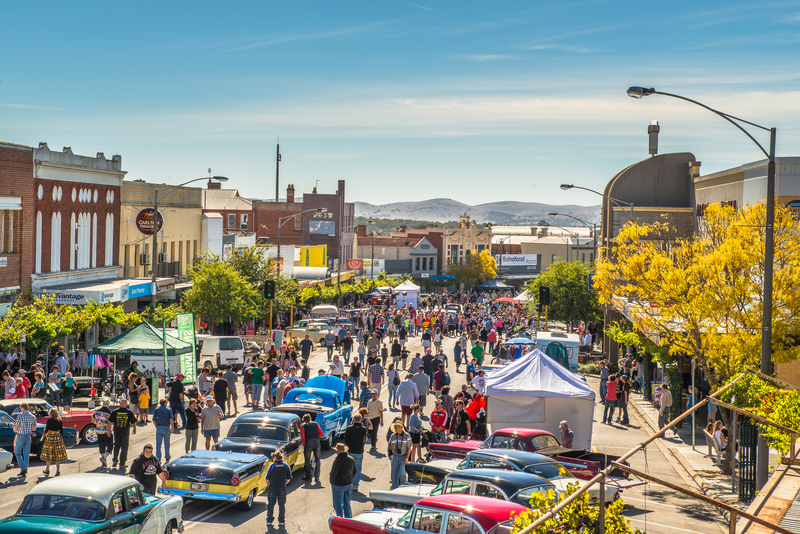 All the iconic items and themes of the fabulous 50’s & 60’s are celebrated over the weekend in Ararat. The Ararat Jailhouse Rock Festival has been conducted by a volunteer committee as an annual event for the last 24 years with the support of the Ararat Rural City Council, and generous sponsorship from local & regional businesses. So dust off the dance shoes, polish the Hot Rod, dress to impress and please accept our invitation to join us in Ararat. Motorsport Street Cruise Parade from 3 pm (see Street Cruise in 'What's On' events page). Back at the bottom of Barkly Street. Dress in your finest for the day, you never know what surprises you may find. Children’s Entertainment, sideshows and lots more. Food stalls for you to overindulge or just grab a bite to eat. Fun Day of Cars, Bikes, Music, Dancing, Fashion, Family and Friends.